those pants are all sorts of fantastic, I haven’t seen any quite as good!! You look perfect and put together as always. Love those pants, Jen! And the chain detailing on your jacket is just fantastic. You’ve got incredible style! I love your Zara pumps–I’ve got to get some Zara shoes one of these days. They always look so chic! Brocade in subtle colours like this definitely make it easier to wear and style! You have the best and most versatile collection of pants ever! Brocade is so luxe and elegant and is so beautiful, especially for this time of year! I think a brocade blazer would be incredible! I love the pants! It looks great paired with that jacket! the pants are fabulous! you look great in this outfit – polished but casual. love! My pair of brocade denim has become a favourite in my wardrobe. 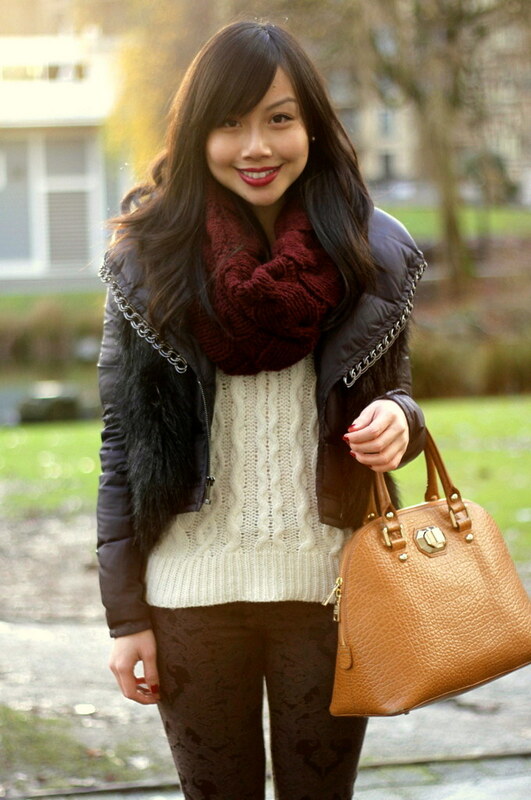 I love the way you styled yours with chunky knits and faux fur.